This free doll pattern can be your jumping off point into the world of making dolls! It is easy enough for even beginning sewers and more advanced crafters can customize it to make it their very own design. Simple rag dolls in this style have been made for hundreds of years and you can make one in the classic style with hand-stitching or you can save time and use your sewing machine. For this free doll pattern I suggest using a sturdy bottom-weight fabric such as canvas, linen, denim or upholstery fabric for your dolls if they are to be loved by children. These fabrics will make a much sturdier doll, but you can also try classic quilting cotton too as it is hard to resist the many prints and colors available. For stuffing you can use polyfill, wool, bamboo, cotton or even cut up fabric scraps. Some people like to partially fill their rag dolls with beans or rice to give a heavier weight, but this is not recommended for children under the age of three or children who are rough on their dolls or you'll have a giant mess later. If you really want to weight your doll you can also sew a little fabric packet filled with rice or beans that you slip inside of the doll, this will give an added layer of no spill protection. Here is the free doll pattern PDF for the head, legs and arms and here is free doll body pattern PDF to download. However, after seeing the free doll pattern photo instructions below and understanding the process you'll soon realize that you don't even need this pattern! 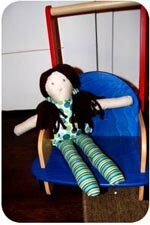 You can easily draw out the simple shapes on your fabric and make your very own custom doll. For example, a longer body and shorter legs will look like a longer dress, make the bottom of her dress wider for a fuller dress, add curve to the arms, add thumbs, a bigger head...this free doll pattern is just a jumping off point! 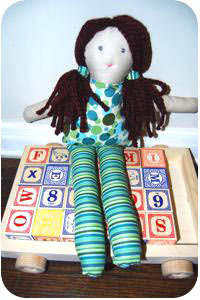 Once you understand the basics of sewing rag dolls you can make your very own design. First, cut out your pattern pieces, 2 head, 2 body, 4 arms and 4 legs. You can use the free doll pattern above or you can draw your own directly onto your fabric. Make sure your arms and legs aren't too large compared to your body and head or it will be difficult to tuck them inside and sew the outer edges as explained below. Next, sew both head circles to the body panel and sew the arms and legs pieces together, with right sides facing each other. Then turn the arms and legs right side out. A pencil or a chopstick can be a handy tool to help with pulling them right side out if you have trouble. Stuff the legs and the arms with your stuffing of choice. Please note, in the photo above, the stuffing shown was used to stuff just one leg...so you may need more stuffing than you think! The amount you use is up to you, whether you want a softer, more floppy doll or a firm doll. Reshape from the outside by rolling the legs or arm tubes between your hands. Now place one head & body panel right side up and pin and then sew on the doll arms as shown. You are sewing from the "inside out" and this might be unfamiliar to new sewers, so make sure you are sewing the arms onto the right side of your fabric, with the hands pointing in. Do the same thing with the legs on the bottom, point the feet towards the head and sew the open leg edges to the right side of the fabric. Next, you'll need to fold up your arms and legs to get them out of the way. You can use pins, safety pins or even tape to tape the arms down. The legs easily fold up toward the head. You need to secure them out of the way to sew the top head/dress panel down. Lay your second head & body panel right side down on top of the folded up legs and arms. Pin the outer edges all the way around except for the very top of the head. You should have a little body and head packet with the wrong side of the fabric exposed. Sew all around the edge (except for the top of the head) sewing right through the ends of each arm and leg where you've already sewn, where they attach to the body. Turn your doll right side out through the top of the head that you left unsewn. 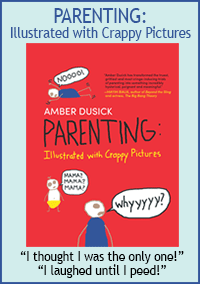 You should now have a flat doll with arms and legs securely attached! Stuff the body and the head through the hole in the head. After you've finished stuffing the body and head, you can stitch the top of the head shut. If you plan to add hair it doesn't need to be perfect as it will be covered up. For yarn hair in two pigtails, take one piece of your very thick yarn (make sure it is washable) and cut to the length you desire for the hair. Next, cut several same size pieces of yarn. Stitch the yarn down on the center part line, starting at the front and continue all the way down the back of the head. Use thick embroidery floss and make sure to pull tight and sew on very securely. I usually use several pieces of embroidery floss and sew over the center part a few times to make sure that even if one thread were to break there are others securing the hair on. Next, create pigtails by pulling the yarn hair to the sides of the head and stitch it onto the sides of the head. You can then either braid the remaining yarn or leave as yarn pigtails. At this point, if you'd like a faceless doll you are all finished! Other options for finishing the face are felt, paint or embroidery. For felt, a more secure method is to sew on using a blanket stitch, although some people simply use glue. You can easily paint on a face using acrylic paint or fabric paint and if you used a canvas type fabric you can even draw on your face first lightly in pencil. Lastly, you can embroider facial features easily by inserting your needle from the back of the head, just go under the hair and the hair will cover it up in back. All done! You might also want to have fun and get creative with accessories for your doll, matching strips of fabric as pigtail holders, scarves, hats, aprons, socks, vests, shoes, barrettes and more. Perhaps she needs a little sewn pet kitty or doggy or baby? A purse? How about a pocket on her dress? You could have a lot of fun customizing your doll.